Water is an important commodity. Without it your future can be measured in hours as easily as it can be measured in days. Attempting to run for half of a day or a whole day requires a large amount of water. So much water that it would be prohibitive to carry all of your water from the start. Additionally, how you carry the water will make a difference for your comfort and hydration. Pick a method that allows you to drink a little bit whenever you want. That is to say a water bladder or a water bottle you can sip from. Unfortunately, a traditional one liter Nalgene will probably not work. With a splash guard you can walk and drink however walking and running are somewhat different. A one liter Nalgene is also hard to hold for more than a few minutes. I started my trail runs with a 100 ounce Camelbak. I would fill it as full as I thought I needed it. It worked well. The mouth piece was near my mouth so drinking was easy. Unfortunately, the water sloshed around and bounced up and down on my back. The weight of the backpack was also unwelcome, despite it being less than a pound. A nice option for very long trail runs where an overnight stay might be required. The second option, and my currently preferred option is hand held water bottles. I have a pair of Ultimate Direction FastDraw Plus water bottles. Each bottle is twenty ounces. Take one or two depending on the length of your run. 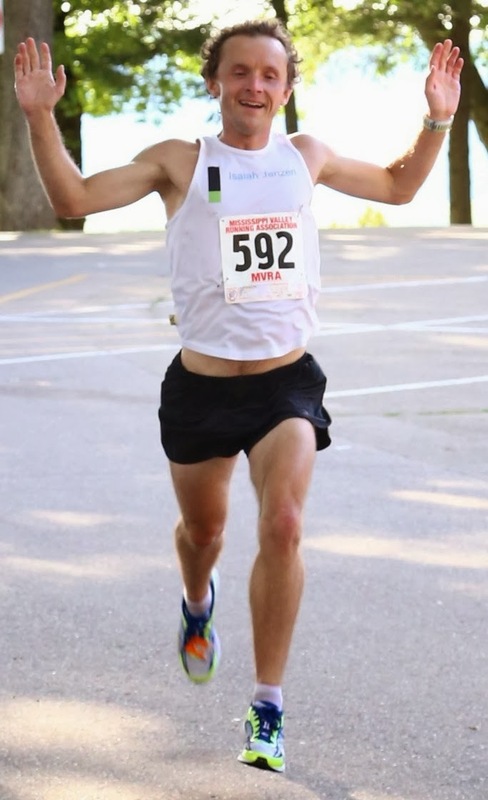 I do have a smaller four ounce elliptical water bottle that I use occasionally on long road runs when I am not terribly concerned about hydration but want those four ounces. Other companies make water bottles with hand straps. I bought these because they were highly reviewed and they have worked great! Now if the run is simply a few hours then all the water can be carried from the start. 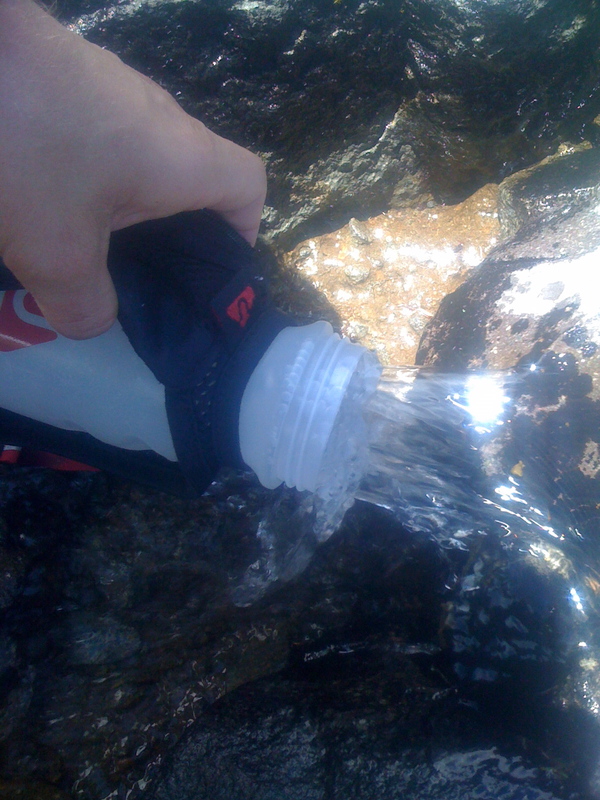 On the more complicated hand, in many trail running situations water will need to be purified along the way. Since I've had quite the tutelage in purifying water I'm going to explain that as well. There are many ways to purify water. First is boiling. Simply boil the water for a few minutes (the exact length of time is very disputed from the second it starts boiling to ten minutes is what "experts" say). This is the most common method at high altitudes where snow and ice is the only source of water. At lower altitudes for people carrying some amount of weight a filter is most common. One filter can purify hundreds of gallons of water. Once the water is purified it is instantly clean. This is a great method but most pumps weight around a pound. Third is a UV pen. I've never used one but I hear good things about it. However these still weigh a descent amount and the batteries can die. Fourth is iodine. Pour a few drops of concentrated iodine solution or a tablet into a bottle. Five to fifteen minutes later bleed the threads by turning the bottle upside down, unscrewing it until a little water comes out, then screw the lid on tight. Then weight for some length of time, 30 to 120 minutes usually, and enjoy. The fifth method, and my trail running favorite, is Micropur MP1. It is very similar to iodine. It uses chlorine dioxide to kill everything in the water. The water tastes like pool water. Anyway, as I was 70 odd miles into the Wonderland Trail I had to purify another bottle after coming over Panhandle Gap and to spice up the 90 second experience I took pictures! First I would take the Micropur and my van key out of the pockets on the water bottles. Next I would cut the foil on the Micropur with the key and tear it far enough to get the pill out. Then I would fill the bottle with the cold clear mountain water. Pop in the Micropur and screw the lid on. About fifteen minutes later I would bleed the threads and squeeze some water through the mouthpiece. An hour after I put the lid on I considered the water safe to drink. Not Katadyn recommends four hours to kill everything in the water. However I was using a one liter dose for only 20 ounces. It was also clear water that my hands heat up. Hot water allows the chlorine to work faster. I learned all of this from a Katadyn sales representative four years ago. He said that 30 minutes would kill everything in warm clear water.